Many may not have noticed it at the time, but the world of learning changed in 1990. In November of that year British computer scientist Tim Berners-Lee together with his Belgian colleague Robert Cailliau proposed a project to develop the use of hypertext “to link and access information of various kinds as a web of nodes in which the user can browse at will”…..
Over the next few years the Web turned technical networks into ubiquitous conduits for everyone to use. The Web reduced our need to hold detailed information in our flesh-and-blood memories as it blew away the barriers to easy access. The Web allowed us to reach out easily and establish connections with others that previously were impossible or extremely difficult to make. The Web has allowed us to totally redefine our traditional learning models. It has allowed us to reach beyond content-rich learning approaches and focus on experience-rich learning. It has allowed an evolution from ‘Know What’ learning to ‘Know Who’ and ‘Know How’ learning; and it has allowed the emergence from learning in the silos of our own organisations to learning with and through others across the world – easily and transparently. On a wider plane the Web has been the harbinger of the Collaboration Age. It has blown away many of the barriers to access and has reinforced the power and influence of collaboration and co-operation1 over silo mentalities. In the Collaboration Age it is those who share and work together who are the winners. Those who hide behind organisational garden walls end up deep in weeds. If we’re to succeed we must no longer just collaborate and co-operate inside the ever-softening boundaries of own organisations. We need to do so with others, in some cases even with our competitors. The rather ungainly term ‘co-opetition’ is being increasingly used to define co-operative competition, where competitors work together to achieve increased value at the same time as they are competing with each other. There is no doubt this is one of the ways forward to success. In the world of talent, learning and performance the impact of the Collaboration Age is only now starting to take hold. The emerging understanding that invariably we need to work with others to solve problems is driving these collaborative and co-operative behaviours and, in turn, fuelling a focus on collaborative learning. The Collaborative Age requires collaborative mindsets to drive collaborative learning. We can’t simply redesign content-rich courses and curricula and hope that changes will occur. We need new thinking, new approaches, and new strategies if we’re to fully exploit the potential. However, we’re starting to see some fundamental changes happen in practical ways. This question is being answered by re-imagining traditional learning approaches and defining new and sometimes novel ways for the world of learning and development to respond to today’s challenges. Although experiential and social learning have been around for eons, in the past most structured organisational learning and training has focused on knowledge acquisition and memorising. We filled them up with information and then assessed their abilities of recall. We still see it today in many classrooms and eLearning programmes. This process is (still) generally referred to as ‘knowledge transfer’ and is both overrated and totally inappropriate for the post-1990 world. The ‘knowledge transfer’ model of training is based a number of assumptions that no longer apply. A few years ago David James Clarke IV and I developed a model to address the failings of the first and second of these assumptions. We called it MindFind. Inside the MindFind model we explained the migration of traditional learning to the find-access approach2. The find-access approach is based on the fact that with today’s information explosion and the increasingly dynamic nature of information it only makes sense to memorise and ‘learn’ core concepts. These are the bedrock that will be needed for some time. Core concepts are likely to be unchanging, or change very slowly. They are the ‘Newtonian Laws’ of the domain or discipline. Core concepts will apply to most situations and it’s helpful to have them at hand (or in the head). Then you need to familiarise yourself with the contextual job and project-related information. This is likely to change more frequently, so it is often a hindrance to have memorised it. This type of information is better familiarised. You know where it is. You are familiar with its nature and content, and you know how to find, recall and verify it at the point-of-need. And ultimately, the majority of the detailed information or ‘knowledge’ we need at any time is not only ephemeral and in constant flux, it is very often contained in other people’s heads rather than being codified and held in structured documents and databases. If you have learned the ‘Know Who?’ then you will be able to quickly locate and retrieve the detailed information. Over the past 15 years I have worked with the 70:20:10 framework and used it as a powerful tool to help organisations evolve their organisational talent and learning &amp; development approaches from pre-1990 to present day practices. It provides a very good starting point to help make this move. Collaboration sits firmly across the ‘other 90’ - the 70 and 20 (experiential and social elements) - in 70:20:10. We collaborate in our work teams while we learn through experience and practice. We collaborate when we share within and outside our organisations, and we often collaborate as part of our own reflective practices. In fact reflection is usually enhanced when shared with others. Of course, the ‘10’ also provides great opportunities for collaboration. We don’t need to go far to see tangible successes resulting from collaborative behaviours in fields other than learning and development. Year over year, Tesla Motors, Inc. has been able to grow revenues from $413.3M USD to $2.0B USD. Tesla CEO Elon Musk announced in a press release and conference call and blog on June 12, 2014 that the company will allow its technology patents for use by anyone in good faith, in a bid to entice automobile manufacturers to speed up development of electric cars. In an industry (the electric car market) that was killed almost at birth by the the internal combustion engine and mass production of petroleum more than 100 years ago, Tesla has emerged as a shining light the second age of alternative-powered personal vehicles. The driver for Tesla’s collaborative approach and decision to share its patents, usually the ‘gold’ for any innovative organisation, is obvious. In order to grow the market there is a mutual interest in sharing. This behaviour is successful not only for Tesla but for the industry as a whole. The learning industry could take some lessons from Tesla. In the global industry and profession of talent development there are many opportunities to adopt and exploit collaboration as a fundamental tenet of operation. In fact learning professionals owe it to the profession to build practices and platforms to not only help others exploit the benefits of collaboration, but also to collaborate themselves. Without the adoption of collaborative mindsets, learning and development professionals and the entire industry that supports talent development will find themselves foundering and failing to join everyone else in the Collaborative Age. that we work as individuals, so individual training and development is the best solution. Whereas we are all aware that the majority people work in teams and that these teams are sometimes fluid and changing, and that ‘organisational learning’ (the learning that organisations undertake) is all about developing the ability to be agile, responsive, reflective and to change rapidly when needed. Organisational learning is not about trying to static build knowledge and skills in some form of ‘competency framework’. 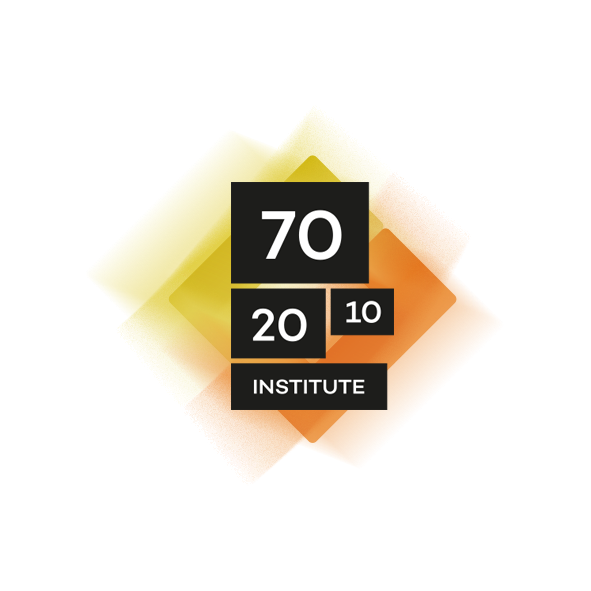 At the 70:20:10 Institute, with our 70:20:10 Methodology, we have developed ways to embed performance support as a core element (but not the only element) in the 70:20:10 solution set. 1 Collaboration and co-operation are two distinct behaviours. My colleague Harold Jarche has written about the distinctions.